You never forget your first slime. A ghostly guardian for your savings money! Astonishing Slimer Bank from the Ghostbusters movie franchise. 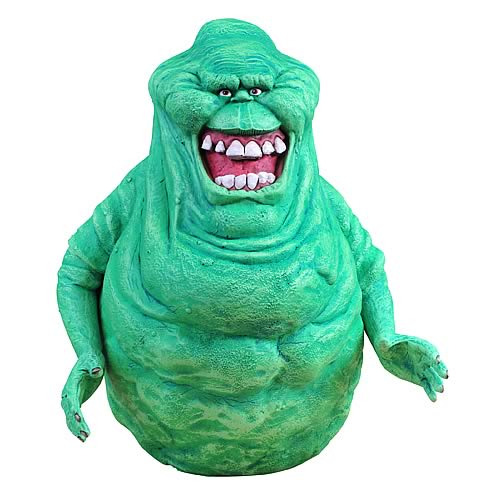 When dealing with ghosts, you don't normally have to be careful about what you feed them... with the obvious exception of Slimer! The standout star of the Ghostbusters movie franchise returns for another hilarious adventure as this Ghostbusters Slimer Bank. He'll help you save and keep you entertained at the same time. Just don't get too close! Standing over 11-inches tall and sculpted by Rudy Garcia, you don't want to miss this frightful release!